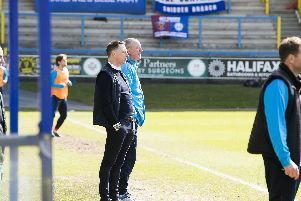 Neil Aspin praised the contribution of youngster Jake Hibbs after he scored in FC Halifax Town’s 2-0 win over York at The Shay. Goals in each half from Hibbs and substitute Connor Hughes rounded off Halifax’s pre-season campaign with a win against the League Two side. The Town boss was happy with his team’s display but thinks there’s still room for improvement ahead of Saturday’s season-opener at Boreham Wood. He said: “I watched York beat Newcastle the other night so they were coming here confident. Hibbs opened the scoring with a curling 20-yard free-kick and produced an eye-catching performance in the centre of midfield. “Jake is a young lad who everybody at the club rates because he’s got a lot of potential but he’s also got a great attitude,” said Aspin. “He trains very hard and he’s got a lot of ability. I felt it was important to give him a bit more responsibility. “He practised a few free-kicks in training and he stepped forward and he’s got his rewards. York had gone close through Callum Rzonca before Hibbs’ goal, but were second best from then on. Hibbs nearly added a second after the interval with a fierce 25-yard shot that flew just over before Hughes sealed the win with a smart finish from 10 yards. Aspin is reserving judgement on his new-look side, but is keen to see plenty of fighting spirit from whoever gets the nod at Boreham Wood on Saturday. He said: “We’ve made changes and now they’ve got to knit together. “We’ve got to get a formation that suits them, which is what we’ve been trying to do in pre-season. “But the main thing is that whichever eleven plays, they represent the club and put in a shift for the supporters. The Town boss said there is still room in his squad for one more addition, but was tight-lipped about who that might be. He added: “I’d like to bring in another one player, whether that’s now or a bit later. “Another one would give us a bit more competition. I wouldn’t rule it out but you wouldn’t be signing somebody to put them straight into the team, but we are looking.